The round 46140 rubber stamp is a convenient, pocket sized self-inking date stamp, from the Printy range of stamps. The stamp creates a circular 40 mm impression, which can include a maximum of 6 lines of personalised text alongside the printed date. The date band on the stamp includes: date, month and 12 consecutive years. The date prints in the centre - be creative and place your text and logo around it. The stamp is available only with red casing and includes a built in dual colour blue and red ink pad. However, compatible ink pads 6/46040 are also available in single colour: black, blue, red, green and violet. Dry felt pads are suitable for special inks. 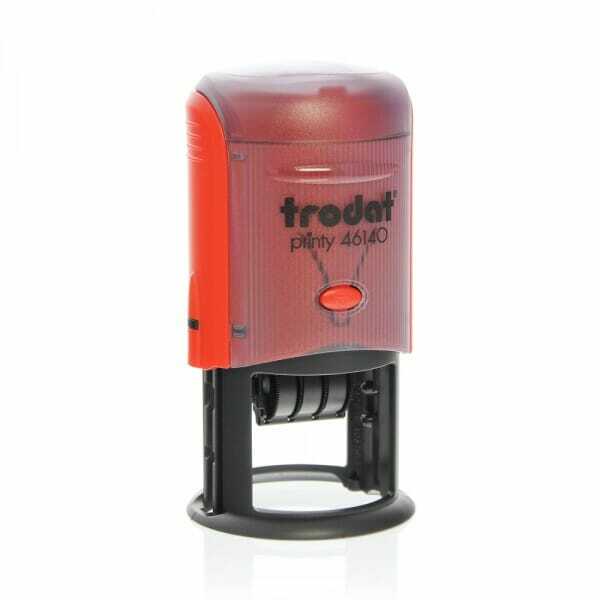 Customer evaluation for "Trodat Printy Dater 46140 40 mm diam. - 3+3 lines"